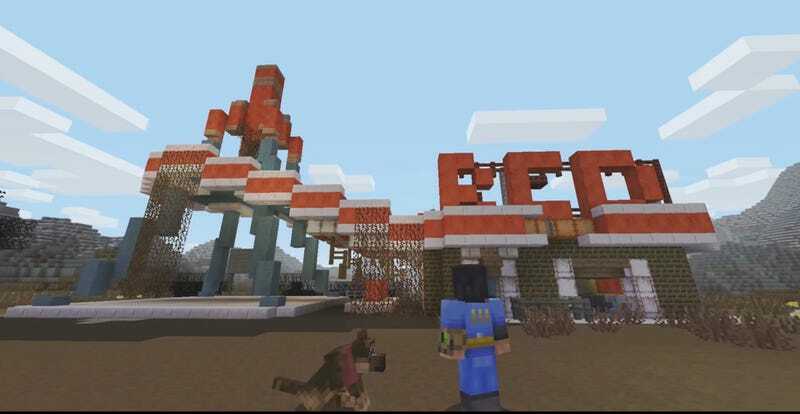 A new add on pack to Minecraft will add locations and characters from the Fallout series. In a new blog post, Mojang revealed that the additions are coming soon to the Xbox One, PlayStation 4, Wii U, Xbox 360, PlayStation 3 and PlayStation Vita. The pack will cost $5.99 USD and will add a variety of locations like Diamond City and Tenpenny Tower. Players will also receive 44 new character skins, which mean we will soon learn what happens when Nick Valentine smooches a creeper. There will be smaller changes as well. An alteration to the games UI will help it resemble the well known Pip-Boy 3000. Music from the Fallout series will make long treks in the wilderness feel jaunty. No word if we’ll get to hear from the irreplaceable Three Dog. Awooooooo!